I’ve blogged previously on why you’d want to create your “IDataFactory” and how decorators can help you keep your code clean. In this post I’ll expand on that subject. A given node contains five children. 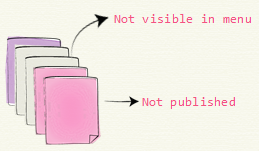 Two of these (in grey) are not visible in menues and two (in pink) are not yet published. Depending on the context these children are fetched you’d want a different subset of these pages returned to you. If you’re in edit/admin mode you might want to see all the pages, if you’re on the public part of the site you’d probably want to remove the not published pages (FilterForVisitor) and if you’re generating some sort of menu you’d probably also want to remove the pages that are not visible in menus. Fetching content is done through the IContentRepository and it’s default implementation, the familiar DataFactory. I prefere to create my own repository interface to avoid mixing the two and also make it easier to alter. The base fetching of content will be handled by IContentRepository and my own base will basically just forward calls to that. We’re using an abstract base class with all virtual methods for the IContentRepository methods that just delegates to whatever implementation of IContentRepository was passed in. It’s implemented as a base class partly because ICOntentRepository contains so many methods and you often only want to decorate certain methods. 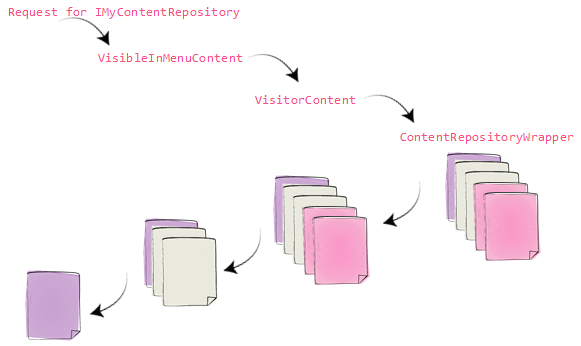 There is often no need to implement anything special for the MoveToWastebasket method in a decorator dealing with FilterForVisitor for instance so to save a lot of typing it can be delegated down the chain. Each decorator inheritcs from the base class and implement relevant behavior on relevant methods. Remember that EPiServers own registration make sure that when SM is asked for an implementation of IContentRepository it will resolve to DataFactory. We need to make sure to setup “our” IMyContentRepository. There are many ways of achieving this and here’s one (I’ve written more about containers and Epi 7 here and here). Remember our controller that takes an IMyContentRepository? This class does not care which implementation it uses making it easy to change how it behaves without altering the StartPageController class. This controller is fairly static in it’s use (it’s used to generate the model for the start page). But some other services could perhaps be used both on the start page as well is in a schedule job and the ability to inject different content repositories in those two cases without changing the service can be very helpful. Karl Ahlin, Patrik Akselsson, Oskar Bejbom and Mathias Kunto. Also thanks to Cecilia Eskeröd for providing me with some illustrations.